Dr. Ravuri is very professional & an excellent provider. Very polite and knowledgeable. They listened to me and seem to genuinely care. It’s my utmost privilege to introduce myself as your health care provider. I graduated medical school from the University of Health Sciences, Vijaywada, India in 1999. I was lucky to extend my expertise and cultural experiences while doing my residency at St. Barnabas Hospital, Bronx, NY. Later I started my professional career as a full time Hospitalist in CT and Long Island, NY. After relocating to Houston in 2011, I had the honor to work at one of the best hospitals in Houston, Baylor St. Luke’s Medical Center. After being a Hospitalist for 11 years, I decided to start my primary care practice to better understand complex health care and to extend my relationship with the patient as a whole. Its an everyday learning experience to understand the different complex situations that each one of us have to go through and to stand together to find the solutions. Residing in family friendly Sugar Land, TX and being blessed with a loving husband and our three boys has given me an opportunity to continue to work towards my passion. 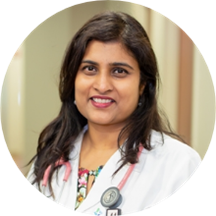 I continue to provide acute care at Houston Methodist Sugar Land and CHI St. Luke’s Sugar Land Hospitals while continuing to build a primary care practice. I hope you will join me in this exciting journey and I will continue to dedicate the next chapter of my medical career in providing a compassionate, comprehensive medical care. Dr. listened to me patiently and answered all my questions. Explained everything. Put me at ease. Nurse and Doctor were both very nice and informative.